The Fourth » They are baddies, after all. They are baddies, after all. I’m changing the way I color Cyril’s eyebrows. >_> I’ll go back and retcon yesterday’s strip over the weekend. In honor of our 200th page coming up, I’ve been making a few changes to the site! (Also because I’ve had some downtime at work.) For one thing, all the comics are now categorized into chapters, which should make it a *bit* easier to go through the archives as well as help to organize our story better. (I would like to make title pages for each chapter eventually, but that’s not in the near future.) Also, I set up a new Gallery under “Extras” where I can post any extra art I do for The Fourth that doesn’t appear within the comic itself. I also added a couple new things to the fan art page. Is a drawing of yours there? If not, it should be! Free publicity AND my eternal gratitude could be yours! Nice dramatic shading for panel 2 there! That really does work for more dramatic scenes. Rofl, everyone looks like they’re going to enjoy this in the way that a normal villain henchman(/woman) would . . . except Slice, who’s just plain enjoying it. After three hours of listening to THAT, who WOULDN’T be happy to have at him? Surprised the whole bar isn’t back there. Heck, how’d the whole bar even let him FINISH? It would seem Cyril’s special bardic power consists of a paralyzing effect. It’s like music that soothes the savage beast, in a very forceful and unpleasant way. In other news, that’s gonna end up being some kind of amulet of protection isn’t it? Such would be their usual luck, hehe. On a slightly different note, Floyd is really creepy with that smile and is still awesome at the same time. Oh hey look a wall of text. When the gods laid the curse, so too did they set the forces of genetics in motion that would create the being most absolutely repugnant to the yet unborn Tiberius the Fourth. They work in mysterious ways. i really like this page, with the shading and the silhouettes, he not getting the whole intimidation thing, and of course the action in the last panel (with slice smiling) really well done! Thanks! I kind of hated this page last night because it was keeping me from bed, but looking at it now, it do like how it turned out. It do like how it turned out? Speak for yourself, woman! That panel with shaded Cyril isn’t bad either! Nice lighting on that. also, i like that you can now comment on the fan art. I think you have always been able to if you clicked them, it was just less obvious because there was the whole picture instead of just a thumbnail, so you didn’t have to click. I’m happy to say we have enough fanart now I think it warranted the thumbnail thing. Recently I just want to sleep and sleep forever… but there are comics to be drawn and saxophones to be played, plays to be acted in, money to be earned… and even, when I’m lucky, games to be played! Resisting the urge to make a creeper joke with that “shame if something were to happen to it” line…. 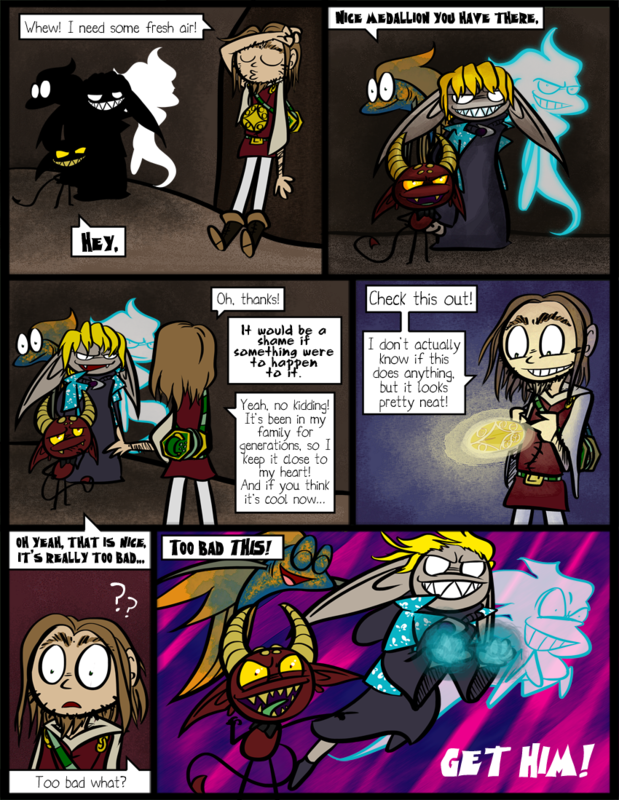 Also, I’m agreeing with mystrylshada about the lighting in second panel; it works wonders. That’sss a very nice medallion you have there, it would be a ssshame if something were to happen to it…. After the music they were forced to listen to its only fair. Maybe he is trying to hug Cyril to death. Also, I really like the Extras page! It’s nice to see the little things that aren’t in the comic. Thanks! I’m not done yet though; I need to get around to updating the avatars. They’re all really old…! Man, Floyd, or lurkins in general perhaps, can pull off a great slasher smile. I sometimes forget he’s evil. Calling it now: The Amulet only works for Cyril. Bards are useful on a quest. Cyril can use Inspire Courage! The courage is because you’d rather die in battle than have to listen to his music anymore! Aww, I already pointed out that tidbit about the amulet… I guess my comment WAS tl;dr.
Naw, I just didn’t read the comments before I posted. Panel 2: Slice, that’s not very intimidating. How come all the Lurkins at Castle Skarva have to were a uniform, (the robe) but there’s no uniform for flish/ghosts? Oh, Slice. It’s like no one told him he was supposed to be evil. He looks like he’s trying out to be an extra in MLP. Come on, look at his expression in that last panel and not hear Pinky Pie’s voice. Also, captcha bonus! ‘Wise mpnfec, which sounds like an ironic Celtic slur. I wonder how long it took them to get in that pose. I hope everyone’s right about Cyril having to go along with them, because I really want to learn how his family came in possession of it. *Leans forward* ..But a question, how would one, specifically, submit fan-art hmmn? :0c I probably missed it somewhere, ahh, and figured it was miniscule enough to ask via comment lol.